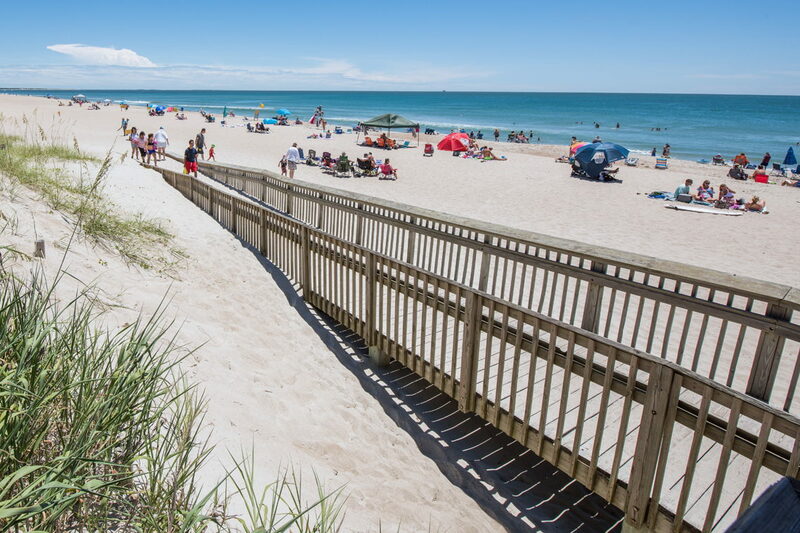 Considering that the Crystal Coast shoreline extends all the way from Portsmouth Island to the Town of Emerald Isle, it is not that surprising that the local beach rules and regulations can be varied, depending on your location. From the isolated Cape Lookout National Seashore to the beach towns in the busy southern Crystal Coast region, every community has its own set of guidelines when it comes to enjoying the sunny local shorelines. So before you head to the seashore, be sure and brush up on the local rules, regulations, and safety tips that will ensure you have a great vacation from start to finish. With so many miles to explore, and accompanying regulations that can change from region to region, a little education can go a long way in enjoying the beaches to the fullest. Start your Crystal Coast beach education with these general guidelines that cover varying regions of this popular coastal North Carolina destination. No Camping - Camping on the beach is not allowed in the Crystal Coast beach towns from Atlantic Beach to Emerald Isle. Where camping is allowed - Camping on the beach is allowed within the Cape Lookout National Seashore. Campers must stay along the oceanfront, and not camp in soundside or undesignated areas. Charcoal grills are generally not allowed within the towns of the Crystal Coast. They are allowed on the Cape Lookout National Seashore, provided they are on the beach close to the water, and typically below the high tide line. Turtle closings - Some areas of the Crystal Coast shoreline may be seasonally closed for endangered bird or sea turtle nesting. These areas will be well marked, and visitors are advised not to enter these temporary closures. Horseback riding on the beach is permitted in the Town of Emerald Isle, from between September 15 to April 30 only. (The beach is closed to horseback riding during the summer months.) Horseback riders should use the beach vehicle access ramps to access the shoreline. No permit is required, however, owners must remove any waste from the beach when riding. Surfing near Piers - Surfing or swimming is not permitted close to the Crystal Coast fishing piers. Surfers should maintain a distance of at least 200 feet from all area piers. Digging - All holes dug in the sand should be refilled before departure to avoid injury to beach-goers, wildlife, and emergency 4WD vehicles. Jet skis or personal watercraft must be operated at least 150 feet away from the soundside shore areas of the Shackleford Banks, North and South Core Banks, and Harkers Island. In Emerald Isle and Atlantic Beach, jet skis or personal watercraft may not be operated at a speed greater than 5 mph within 200 feet of the shoreline, or within 500 feet of an oceanfront fishing pier. Littering is not allowed on any Crystal Coast beaches. All trash – including cigarette butts – should be removed when visitors leave the beach. Local towns, such as Emerald Isle, have trash cans available at public beach accesses. In the Cape Lookout National Seashore, visitors will need to bring along their own trash bags for waste. Stay off dunes - Visitors should not climb the dunes near the oceanfront, or remove any vegetation from the dunes, including sea oats. Red Flags mean no swimming - The town beaches of the Crystal Coast will put up red flags when conditions are dangerous for swimming. Do not enter the water if there are red flags present. There are NO red flags or lifeguarded beaches within the Cape Lookout National Seashore, so visitors should use extra caution. Watch for rip currents! Rip currents can occur in any type of weather, even on calm days. If you are caught in a rip current, swim parallel to the shore until you are no longer in the current, and then swim back to the beach. Do not feed the wildlife, and stay at least 50 feet away from the wild horses in the Cape Lookout National Seashore at all times. Surf fishing is allowed on all beaches within the Crystal Coast. A saltwater fishing license is required, and can be picked up at local tackle shops, or obtained online through the NC Marine Fisheries and Wildlife website. Want to take your 4WD vehicle out to the beach while exploring the Crystal Coast? Here’s what you need to know before you hit the off-road. 4x4 Equipment - Be prepared! Here is the beach driving gear we recommend for a fun day on the sand. Beach driving is allowed at the Cape Lookout National Seashore on the South Core Banks, (aka Cape Lookout), and on the North Core Banks, (aka Portsmouth Island.) Beach diving is also allowed within the Town of Emerald Isle in the off-season, generally from September 15 until April 30. Beach driving is not allowed on the Shackleford Banks, in Fort Macon State Park, or in the towns / communities of Atlantic Beach, Pine Knoll Shores, Indian Beach and Salter Path. A free ORV Education Certificate is required to drive on Cape Lookout National Seashore beaches. A fee-based permit is required to drive on the beaches in the Town of Emerald Isle. All drivers should air down their tires to 20 psi or less to avoid getting stuck. All 4WD vehicles must be street legal, with a valid license plate, registration, and a recent safety inspection from the driver’s home state. Never drive on the oceanfront sand dunes or vegetation, and stick to established tracks in the sand or behind the dune line to avoid getting stuck. Never drive too close to the ocean overwash, as saltwater can damage and even ruin a vehicle. Follow all North Carolina State driving laws, which includes obeying local speed limits, wearing a seatbelt, and not having open containers in the vehicle. Ensure you have tow straps, a shovel, a spare tire, a jack, and a jack board in your vehicle, as well as the number of a local tow truck company, in case of emergency. Drive above the high tide line whenever possible to avoid people enjoying the beach, and to save your vehicle from encroaching saltwater if you do get stuck. Do not drive at night in the Town of Emerald Isle. Night driving is allowed within the Cape Lookout National Seashore. Furry family members enjoy time on the sand too! Here’s what you need to know when taking pets along for a day at the beach on the Crystal Coast. Dogs are allowed on all beaches and islands within the Cape Lookout National Seashore provided they are on a 6’ ft. leash at all times. If you are taking a ferry to the Cape Lookout National Seashore, be sure and check with your ferry provider first before bringing along a pet. Extra fees may apply. There are limited facilities within Cape Lookout National Seashore, so be sure and bring along fresh water, bowls, food, and other pet necessities. Be sure and keep pets at least 50 feet away from all wildlife, including and especially the Shackleford Banks wild horses. Dogs are allowed on the beach, provided they are on a leash at all times. Dogs can walk through The Circle public beach access, but are not allowed to stay there for a long beach visit. Leashes must be no longer than 16’ feet. Owners should clean up after their pet while on the beach. Dogs are permitted on the Town of Emerald Isle beaches but must be on a leash at all times. This includes while on the sand, and while in the water. Waste must be collected and disposed of. Trash cans are located at each public beach access in Emerald Isle. Watch for hot sand! Hot sand can burn a dog’s feet as easily as it can burn a human’s feet. Bring dogs to the beach in the early mornings and evenings on hot summer days. Always keep dogs away from local wildlife, including birds and Cape Lookout’s wild horses. Bring along a canopy or other area of shade for your pet to avoid overheating. Be sure your accommodations are pet friendly, too! Many area vacation rentals, hotels, and motels on the Crystal Coast allow pets for a small extra fee. Bonfires or campfires are allowed at the beach in certain regions of the Crystal Coast area. Information on bonfires by community is listed below. Bonfires or campfires are not allowed within Atlantic Beach, however the town does have seasonal events with community bonfires, live music, and other attractions. Fireworks that leave the ground and / or explode are not allowed on any beaches within the Crystal Coast shoreline. Fireworks of all varieties, (including sparklers), are also illegal within all areas of the Cape Lookout National Seashore. Like many area beach rules, alcohol regulations vary by community on the Crystal Coast. An overview of alcohol-related guidelines is listed below. Beer and wine is allowed on the Town of Emerald Isle beaches, however liquor drinks are prohibited. Glass containers are allowed, but must be disposed of in trash cans, which are found at the end of all public beach accesses. Alcohol is permitted in the Town of Atlantic Beach, but glass containers are not allowed. Alcohol is permitted on the beaches of the Cape Lookout National Seashore, however, visitors must dispose of all waste properly. Trash cans are limited on all islands within the National Seashore, so visitors will want to bring along their own trash bags or containers for disposal. It is illegal to have an open container in a 4WD vehicle on the beach, or to drive on the beach while intoxicated throughout the Crystal Coast. Most towns in the Crystal Coast have noise ordinances, so be sure and keep your celebrations at a low volume.